This is the tune from a song on the common legend of a mermaid who marries a human and raises a family, but in the end leaves, as she can no longer resist the urge to return to the sea. Otherwise known as"A'bhean eudach" (The jealous woman). This is a haunting song about a woman's sister who has left her to drown, so that she can then marry her dead sister's husband. This stems from the time when whalers came to Shetland. A favourite of Fiddler's Bid of which Catriona is a member. A lullaby from the singing of Mary Jane Lamond. 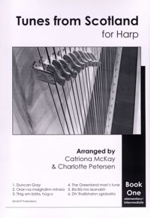 Aport-a-beul Charlotte learned from the singing of Mary Ann Kennedy, which was recorded on their CD Strings Attached.